There have been three GI Joe characters named Vypra: a Cobra vehicle driver, and the twin daughters of the Arashikage swordsmith. This is an update of the former. 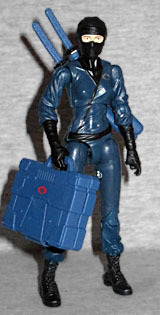 Vypra allegedly offered her srvices to Cobra Commander as a mercenary and intelligence courier by audaciously sneaking into his private business meeting at Extensive Enterprises. Intrigued by her boldness, and needing a trustworthy delivery agent in an organization comprised of backstabbing opportunists, he provided her with an encrypted data package for delivery to Night Creeper Leader at his heavily guarded temple. Performing the task easily and ahead of schedule, she was then granted access to choose her own method of conveyance from the Cobra motor pool for any future missions. Vypra tenaciously defends the secrets of her background, using false histories and even deceptive attire to keep both friend and foe alike from discovering her true motives or the extent of her skills. This lack of any informational leverage, and her willingness to use either stealth or high-powered weapons as the situation demands, make her a very loose cannon, even for the Cobra organization. The original Vypra came out in Generation 2, when Larry Hama was no longer in charge of writing the filecards, so her name was Ann A. Conda and she was "raised in the backwoods and swamps of Louisiana" - that's what this one is getting at with the false identities thing. So from a real-world perspective, they (Hasbro) overwrote a stupid origin with something better; in kayfabe, they (the Joes) realized the previous identity was false, and updated their files accordingly. Win-win! In 1998, Vypra was just a repainted Jinx; so naturally, in 2015, she's exactly the same thing. Mostly. From head to hips, she uses the same be-pajama-ed body seen on the SDCC and movie Jinxes - it's all clingy cloth and tiny wrinkles. But she's more about practicality than tradition, so she's wearing modern pants and boots (which come to us via Renegades Scarlett). This change not only suits the character, it keeps her from just being a "stealth" or "Night Force" repaint. 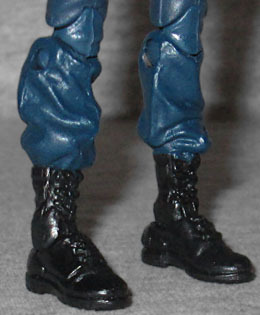 The '90s figure was dark blue with lighter blue patches (camouflage?) airbrushed on, while this one is solid dark blue, with black for the boots, gloves, belt and mask, and a silver Cobra logo on her left breast. That bit on the filecard about being allowed to choose her own vehicle from the motor pool is included because the '98 version was not released singly, but as a driver: she was only available packed in with the Rattler. Not the Rattler you're thinking of - the plane piloted by Wild Weasel - but the we-lost-the-trademark version of the Stinger. 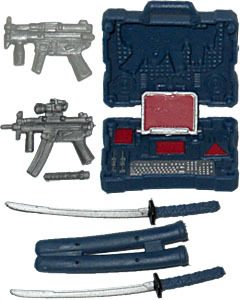 Clearly there's no way this version could come with an entire jeep (any more than Tollbooth could come with a bridge layer, or Keel-Haul with a battleship), so her accessories include Jinx's swords and scabbards, an MP5K with silencer, and a briefcase with a computer and machine gun inside (presumably the "encrypted data package" from her bio). The case is done in Cobra blue, while the gun inside is such a pale gray that it's nearly white. I was truly indifferent to Vypra when she was revealed as one of the figures for FSS 3.0 - the original was kind of a lazy idea for a repaint, and this one didn't seem much better. But by completely reimagining her backstory and changing up what reused parts she's made from, the Collectors' Club came up with something that's better than expected.